IT Professional. Started practicing in 2006. I wish I could say I had a divine revelation that brought me to yoga. But the truth is that my waistline was getting bigger and I had to start some physical exercising to get back in shape. But I am still not entirely sure why among all available options I chose yoga. I suppose one of the reasons was that it was very easy to start practicing. There is no need for any fancy equipment or gear, just a mat and your own body. Deep down I think I have always been fascinated by the beauty of yoga, and at that time I had a very good reason to give it a try. Why did you choose Astanga and Mysore style practice? It was a blind choice. Astanga Yoga just happened to be at the top of the list of yoga styles on Wiki. So I did some Google and YouTube research and I liked what I saw. Two things in particular appealed to me: it was physically demanding practice and one has to learn the same sequence over a long period of time. It changes over years. But right now it’s the way I feel if I miss a day of practice. I feel off balance – physically, emotionally and mentally. It is safe to say that yoga is what keeps me going each day. And then there is always the curiosity: what awaits me next down the yoga road? 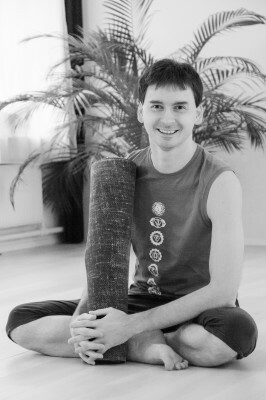 Without any doubts yoga helped me to cope with some health issues I have had. Also yoga taught me to listen to my body, work with it and not against it. As for more subtle aspects I think I became more appreciative of things going on around me. But I can’t be sure I can attribute this solely to yoga. Maybe it’s just me getting older, but most likely it’s both. What I like most about yoga is that it’s a practice and not a competition. There is nothing to get right or to get done on time or to do better than some one else. It really takes the pressure off, one just have to allow it to happen and enjoy it. Same as with life.